Our Rabbits are kept in a 12' by 12' barn. In the summer our rabbits have a large fan running at all times. The French Lops are in 3' by 3' wire cages, or 36" by 36". 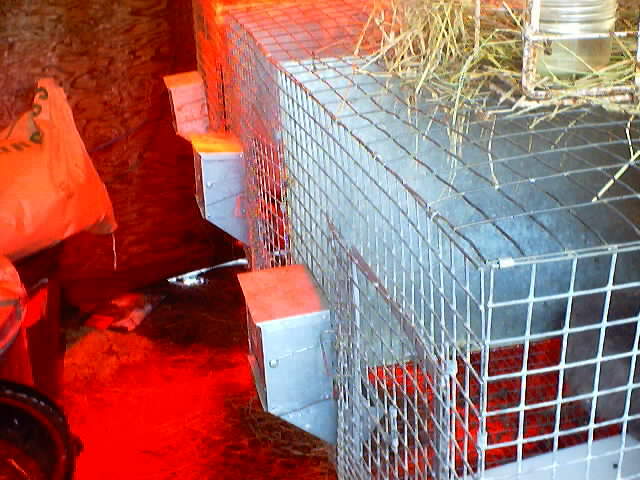 The Holland Lops, are in "24 by 30" or "28 by 30" cages. The Jerseys are in 24 by 24 cages. We feed Burgess rabbit feed 16% and 18%. French lops are free fed. Holland Lops are fed just over 1/2 a cup and free fed with litters, and the Jersey woolies are fed 1/2 a cup per day as well. Most don't eat that much though. They are all given quality hay every day, and get a mixture of Cob and a little calf manna in their feed. In the winter they are kept out of the wind and the barn closes up to keep them warm. 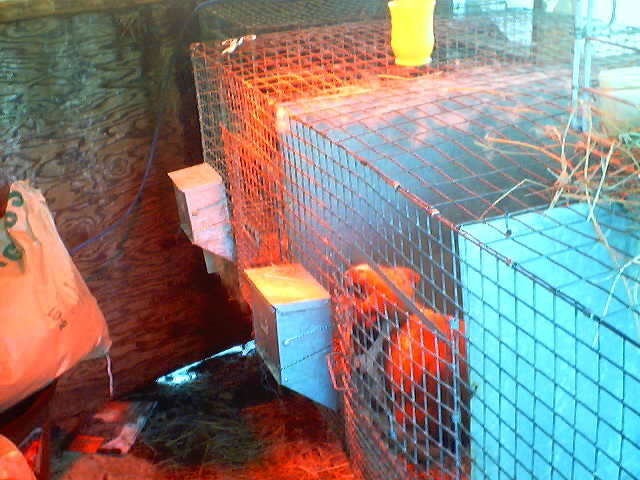 The barn holds 28 rabbits, plus we have another small area that houses 4 rabbits and we can stack 3 others. So we have around 35 holes. 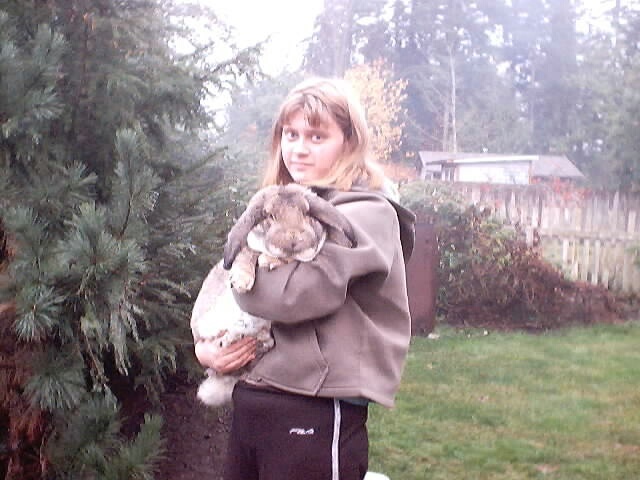 This is Cristina and Etzel, a French Lop. Cristina is my 15 year old sister. I do most of the work with the rabbits but she helps and she loves the shows and she is just starting to breed a few Holland Lops instead of her Mini Lops. This is where Cristina has her 4 rabbits- Kendra, Oreo,(father, daughter) and 2 new ones from Susan Rutherford coming in January. It has some red in it because we have a heat lamp in there right now as it is winter. In the second pic you can just see Kendra in her cage! 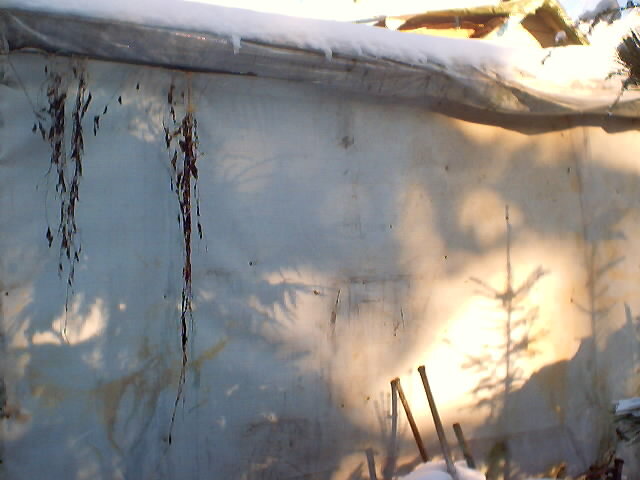 This is a pic of the barn. 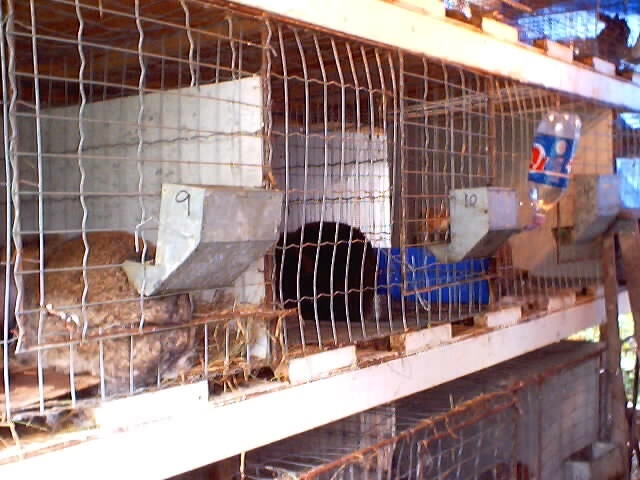 It holds 28 animals, French lop cages can be divided in half for 2 Holland Lops or 2 Jersey Woolies. As that would be 18 by 36 holes. We also have a barn with 4 hole in another area that Cristina using for her Holland Lops. In this barn we have all the French Lops and all Jersey Woolies and my Holland Lops.